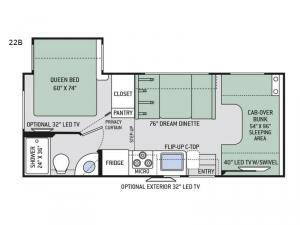 This Four Winds coach is a great Class C motorhome for you to take on any road trip! 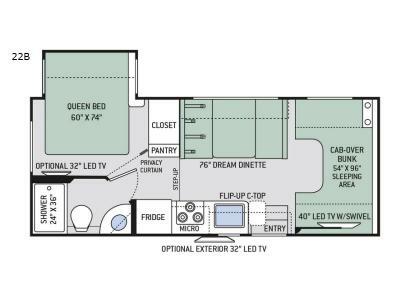 With a rear bath layout, a single slide out for added space, and your choice of chassis and engine, you will quickly see the benefits this unit has to offer. After you are set up at your destination, head inside to enjoy the interior comforts. Here you will find a 76" Dream Dinette which can convert into additional sleeping space, a 54" x 96" bunk over the cab, and a queen-size bed in the rear private bedroom. When you want to unwind for the day, you will love being able to watch your favorite program on the 40" TV above the cab!